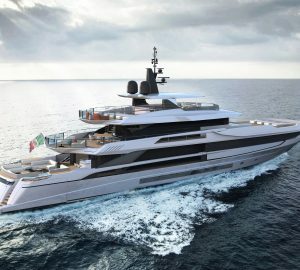 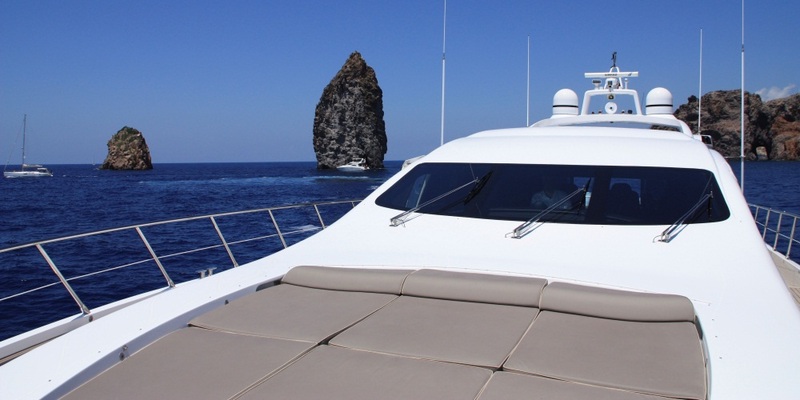 DELHIA measures 92ft and was designed by naval architect Baccigalupo and built by Mangusta (Overmarine) in 2003, the yacht underwent a refit in 2009. 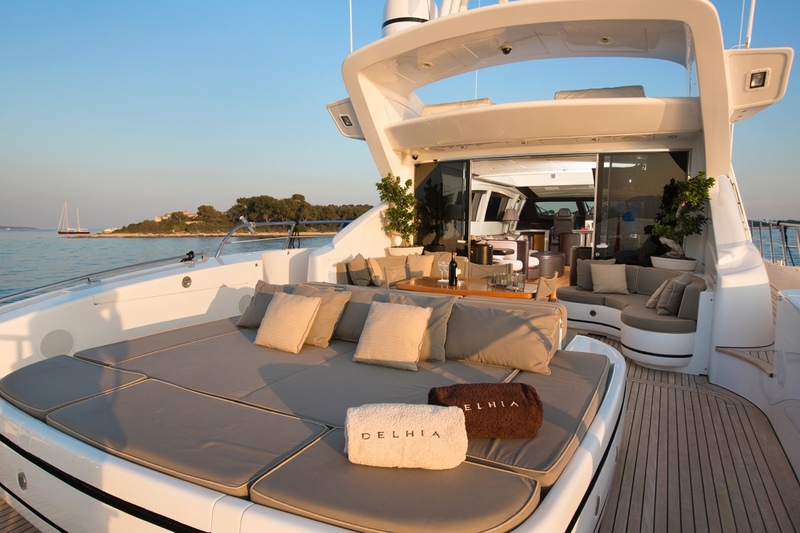 Boasting a sleek planing hull and elegant interior, DELHIA is available for up to 8 charter guests accommodated in 4 cabins. 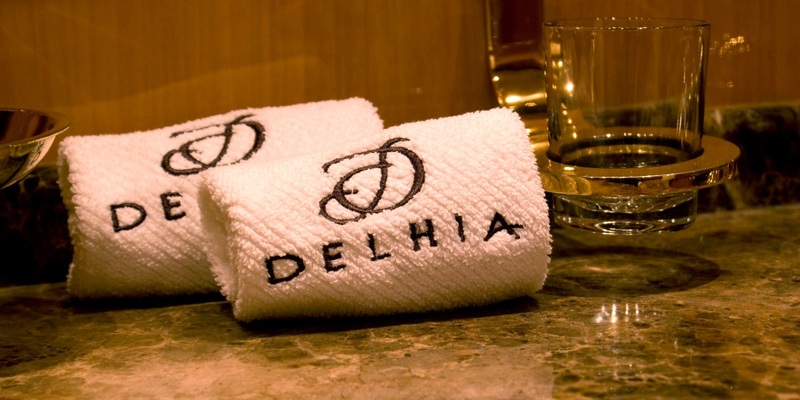 DELHIA has a stylish spacious interior. 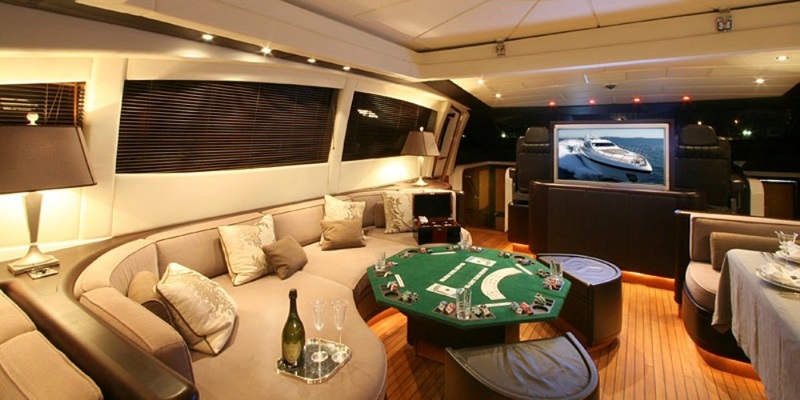 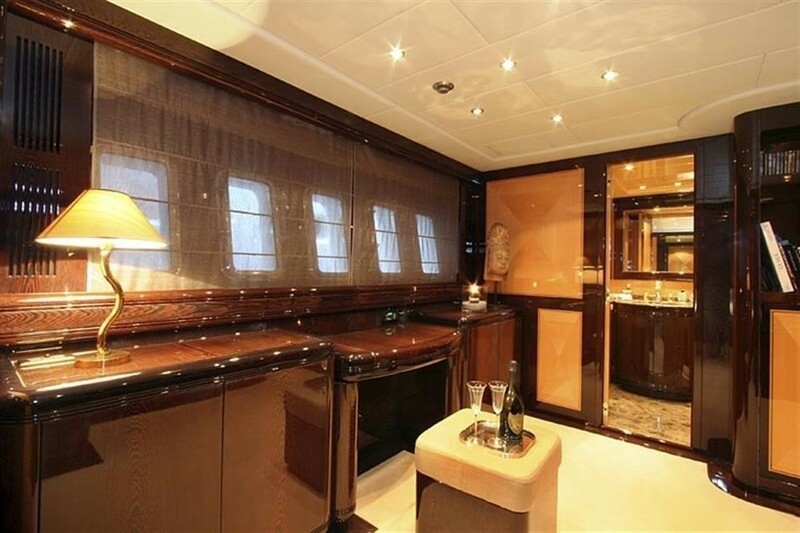 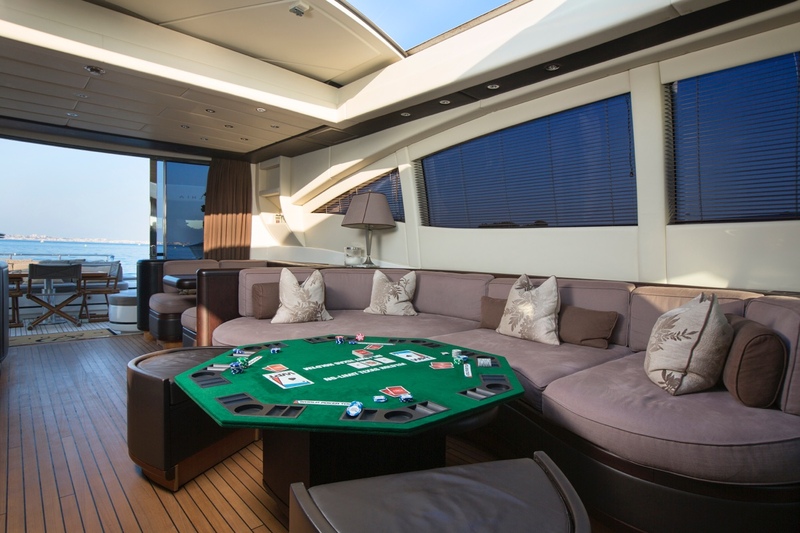 The salon and dining are an open plan on deck level, with a large sofa, formal dining table, games table, marble topped wet bar and large flat screen TV, ideal for entertaining. 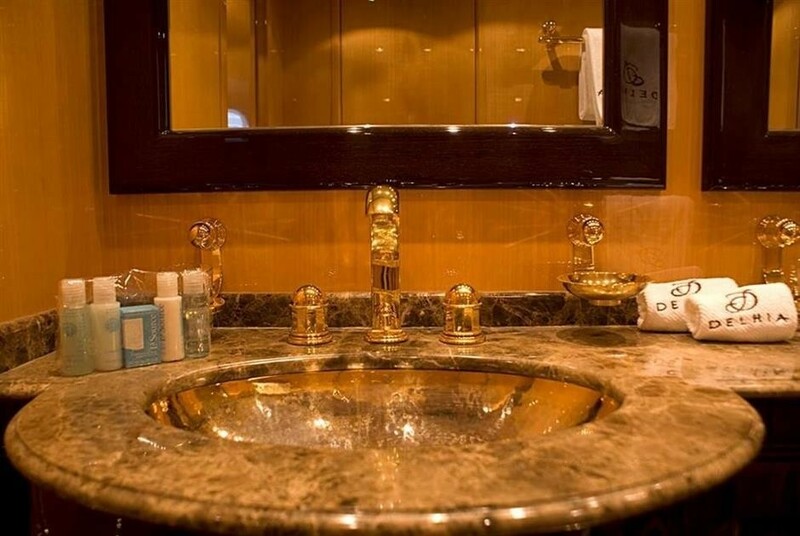 The décor is a warm inviting neutral one, featuring earthy tones of beige and coffee browns, creating a relaxing yet sophisticated atmosphere. 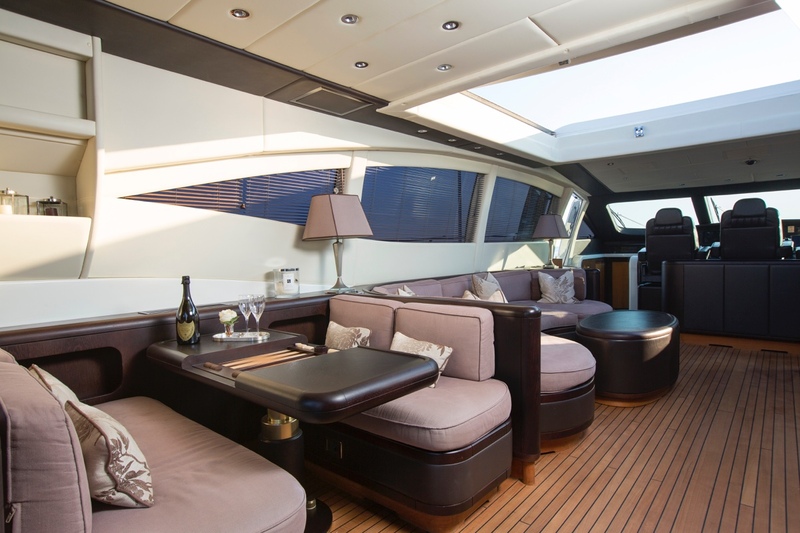 Elongated windows and a retractable roof ensure optimum natural light. 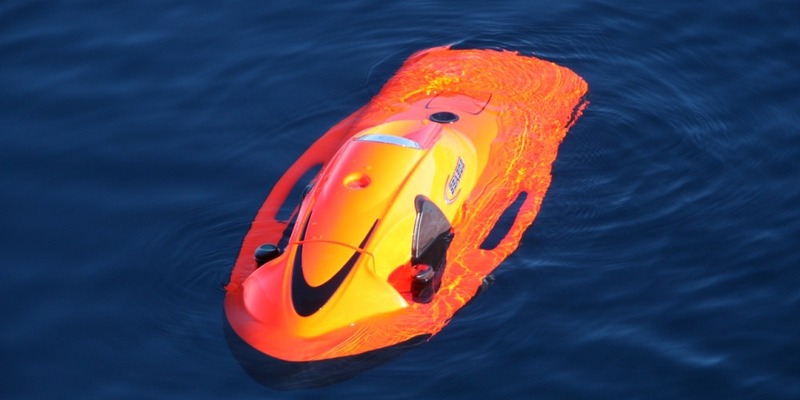 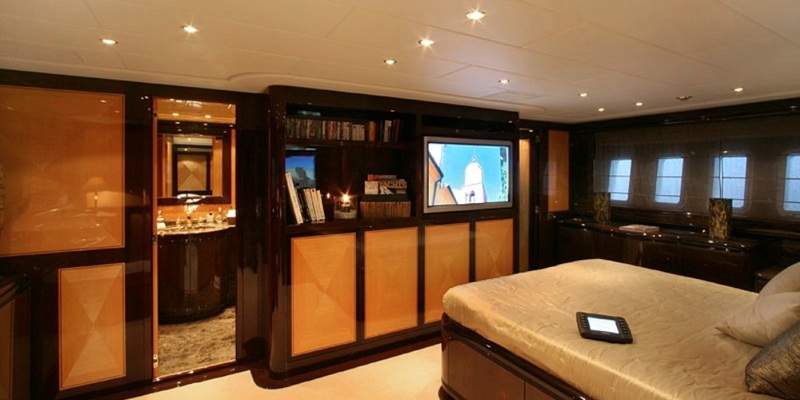 There is plenty of exterior living on board. 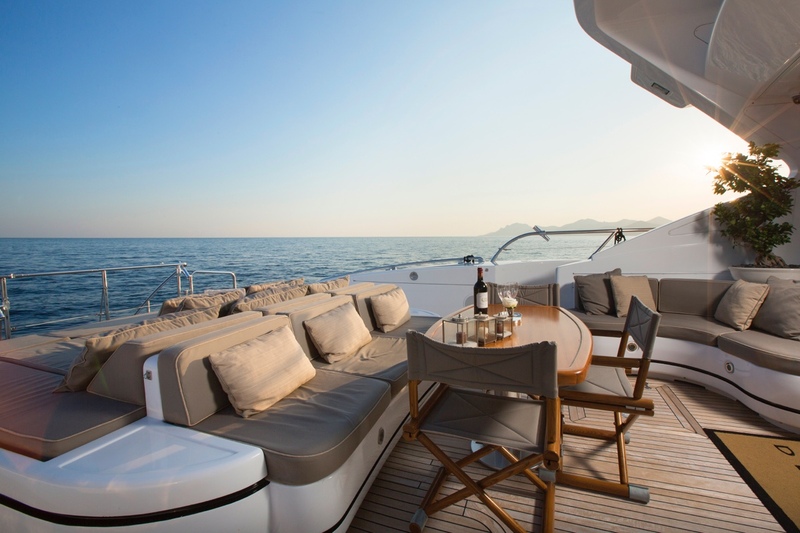 The generous aft deck opens out from the salon providing fabulous flow of space and offers an alfresco dining option, ample seating and large double sunpad. 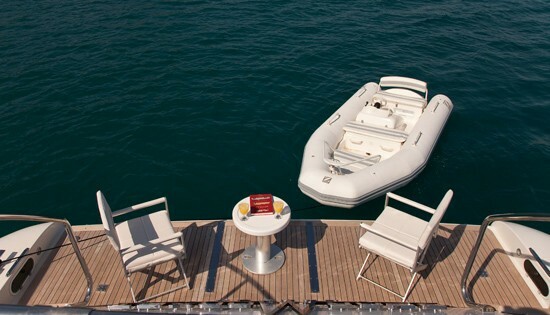 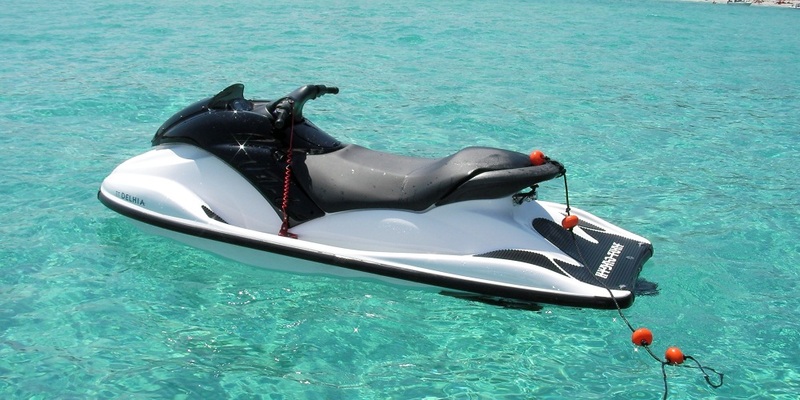 Further aft, the extended swim platform makes water access effortless to enjoy the good selection of water toys on offer. 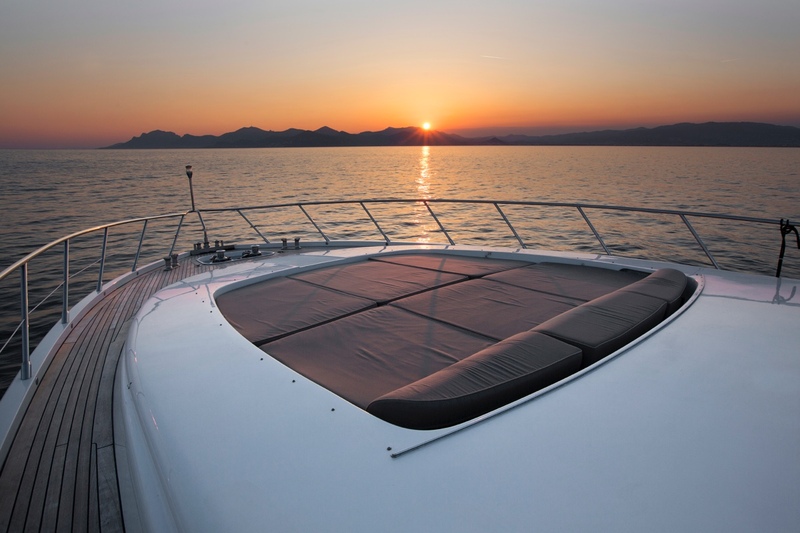 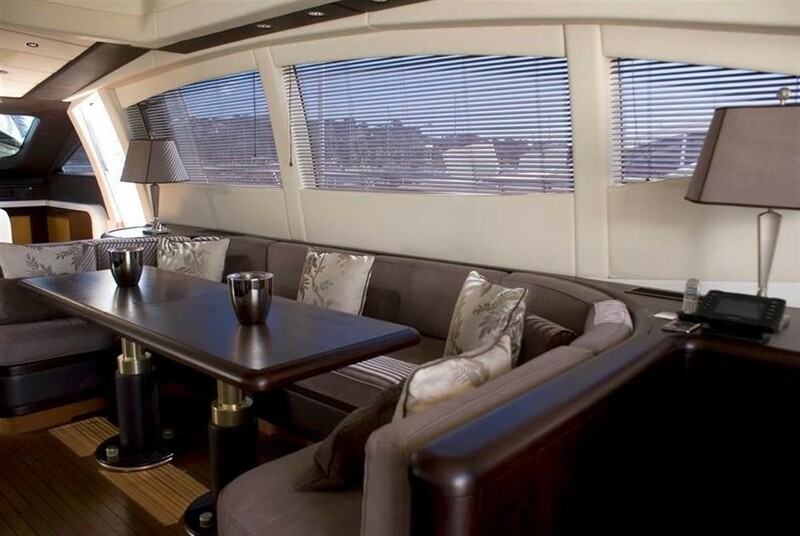 Wide wrap around decks lead to an additional double sunpad on the foredeck. 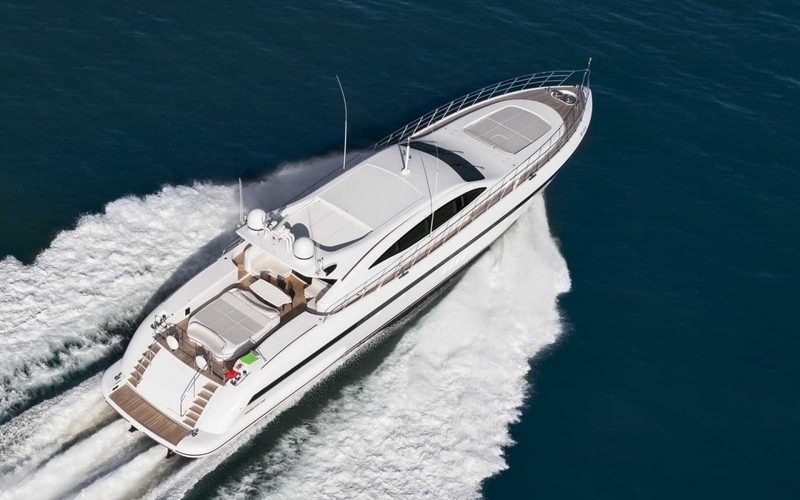 DELHIA has a beam of 6.6m (21.7ft) and a draft of 1.8m (5.11ft), she is powered by 2 x MTU 2000hp engines and is capable of exhilarating speeds of 27 – 34 knots. 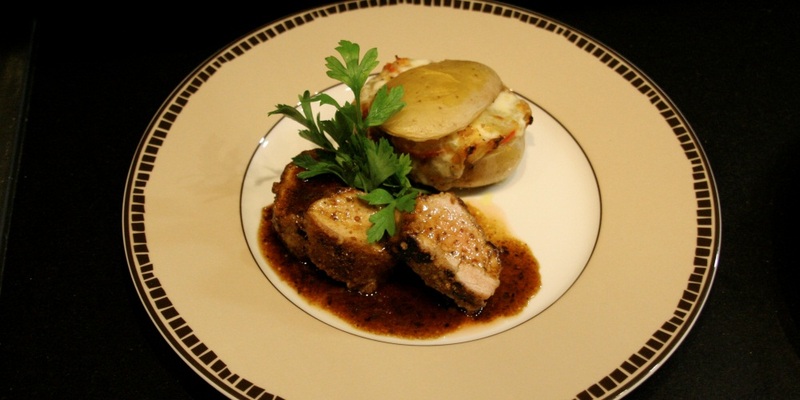 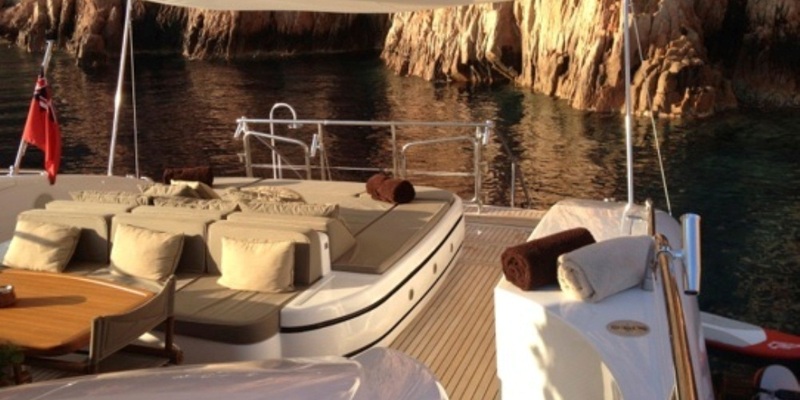 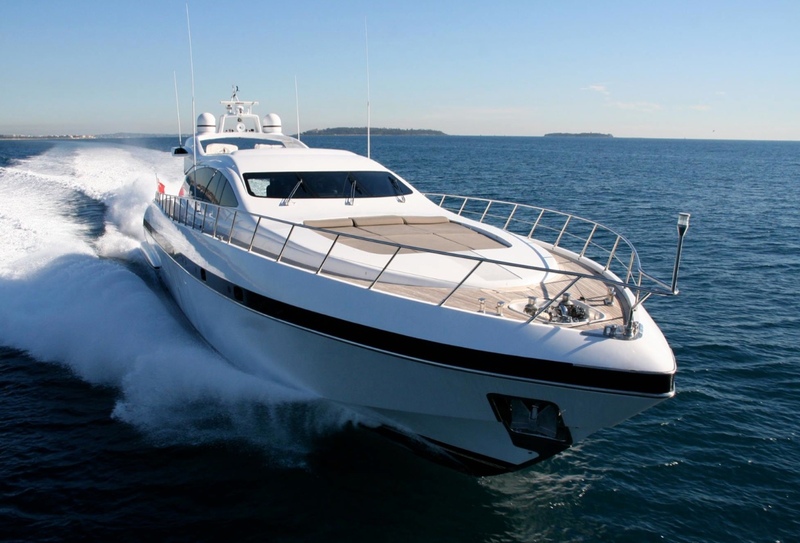 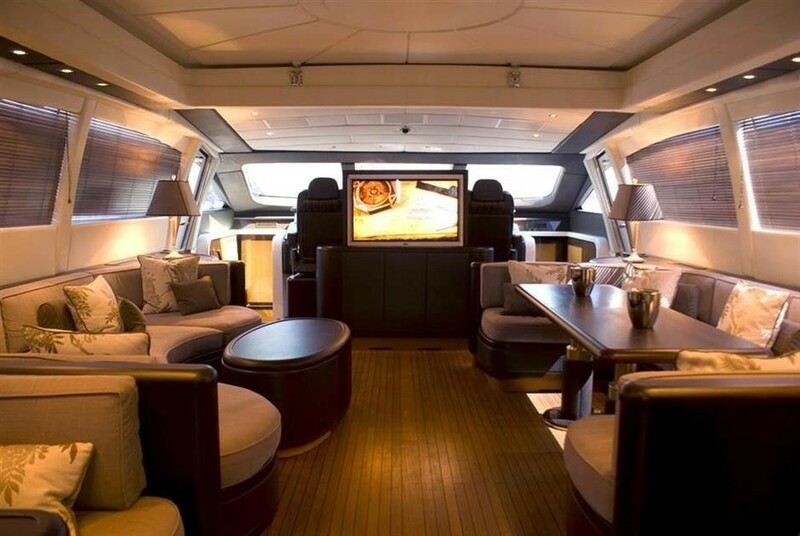 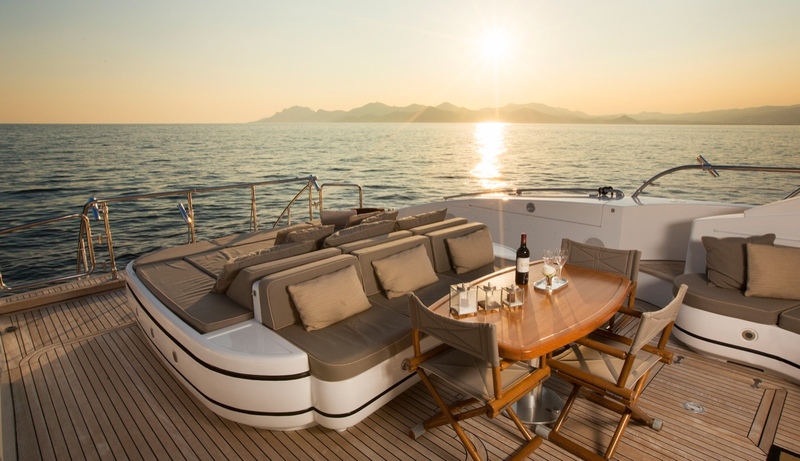 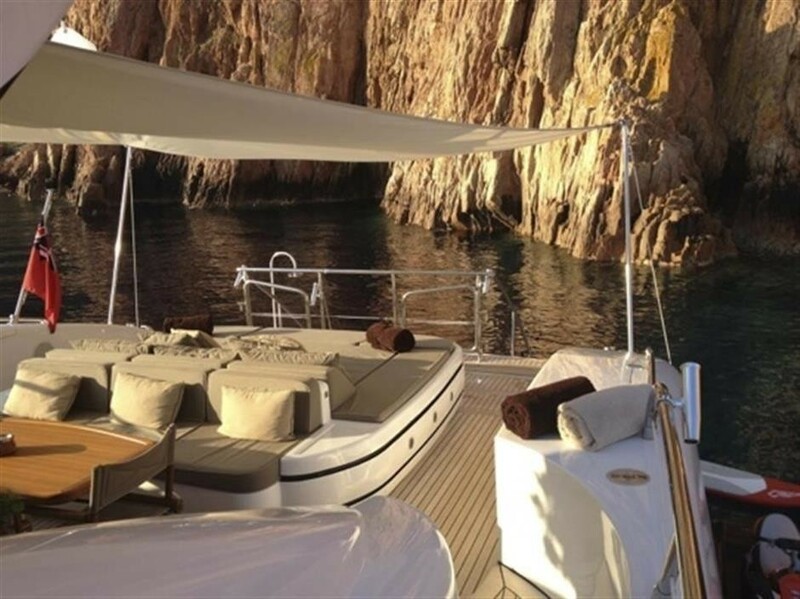 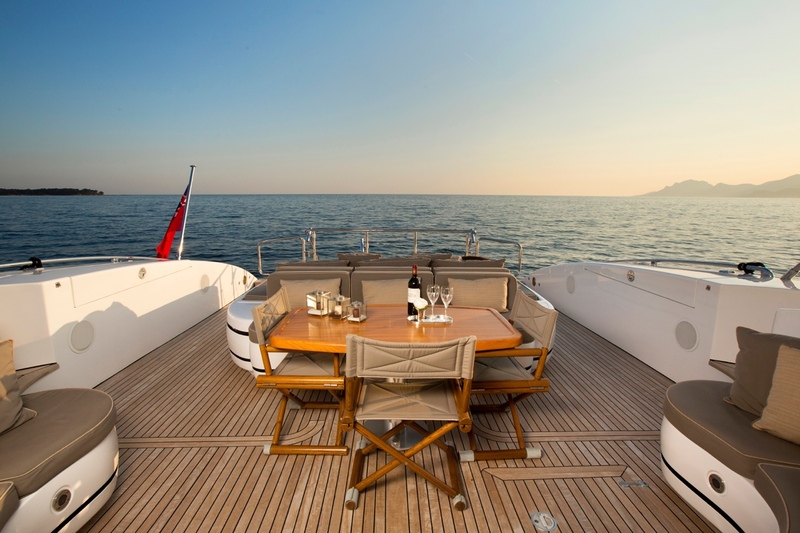 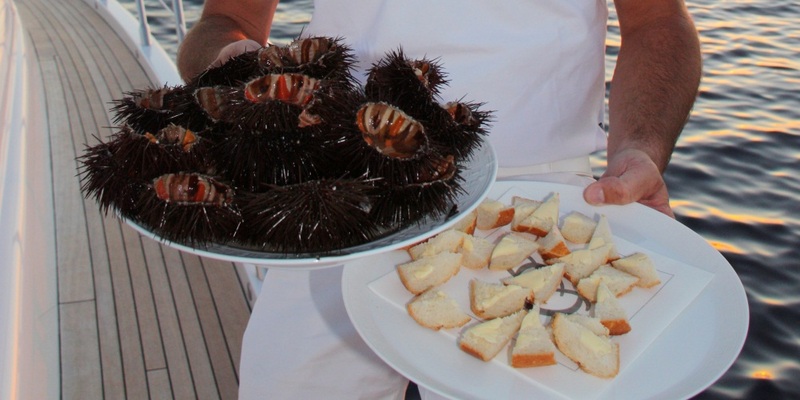 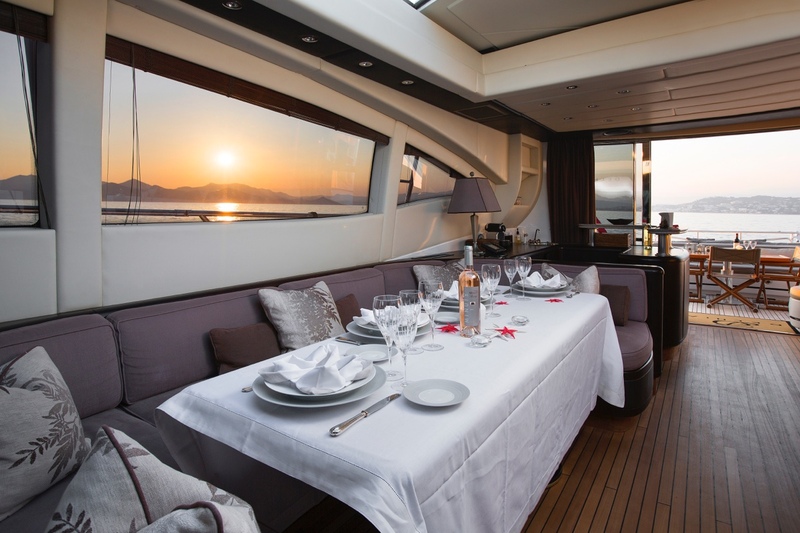 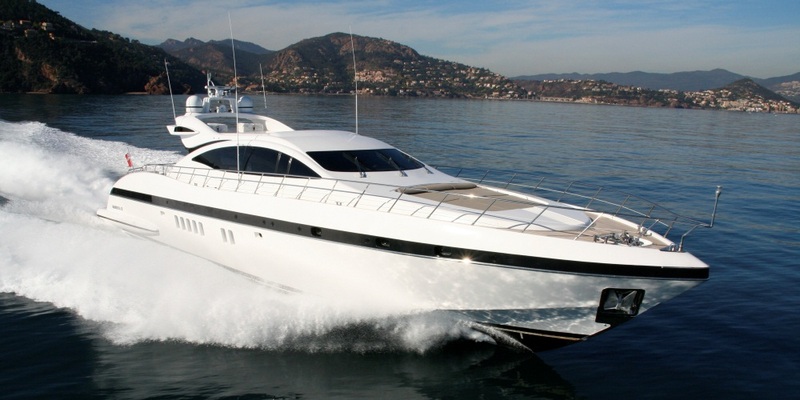 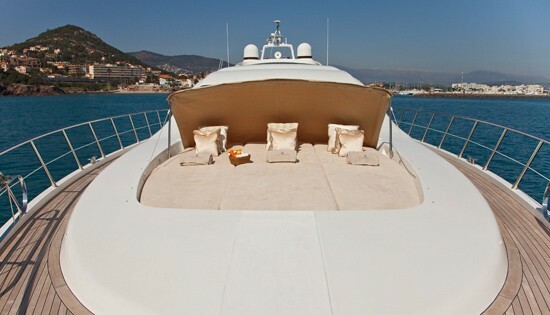 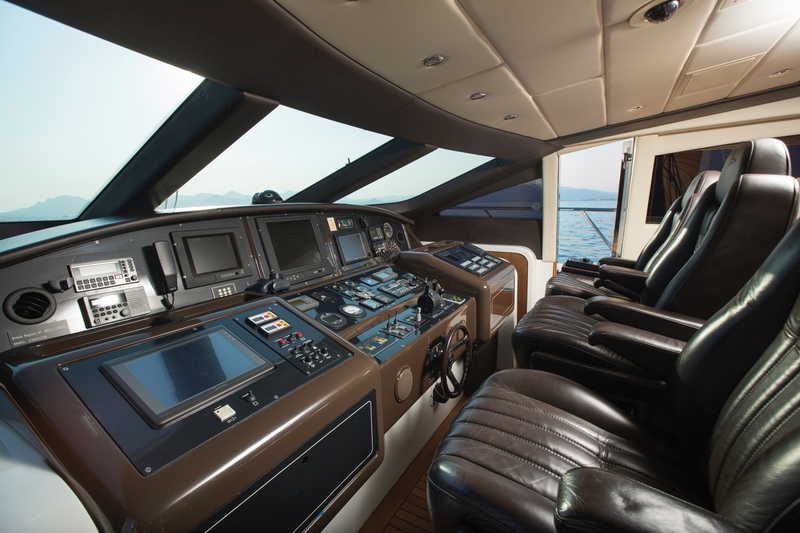 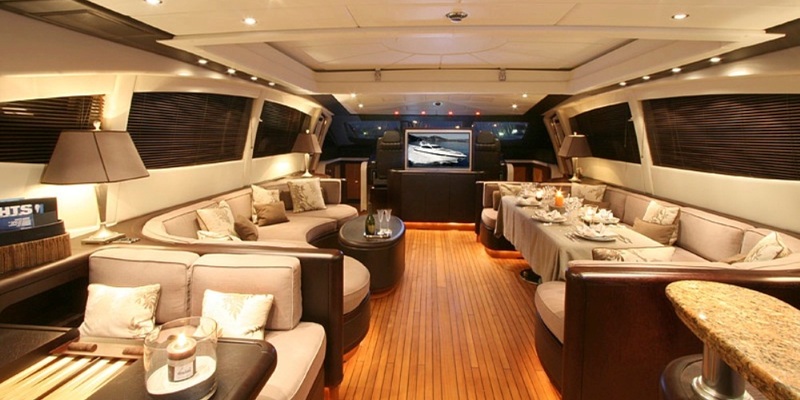 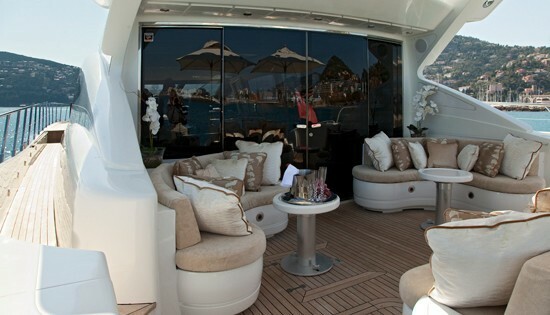 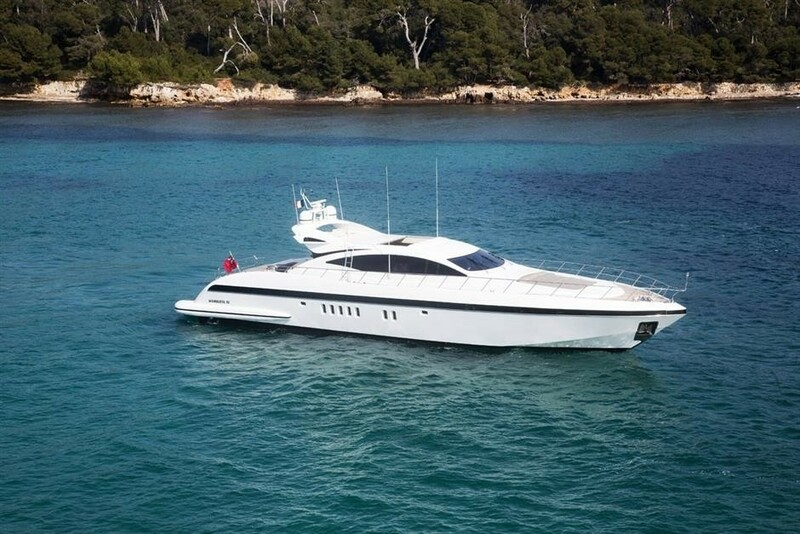 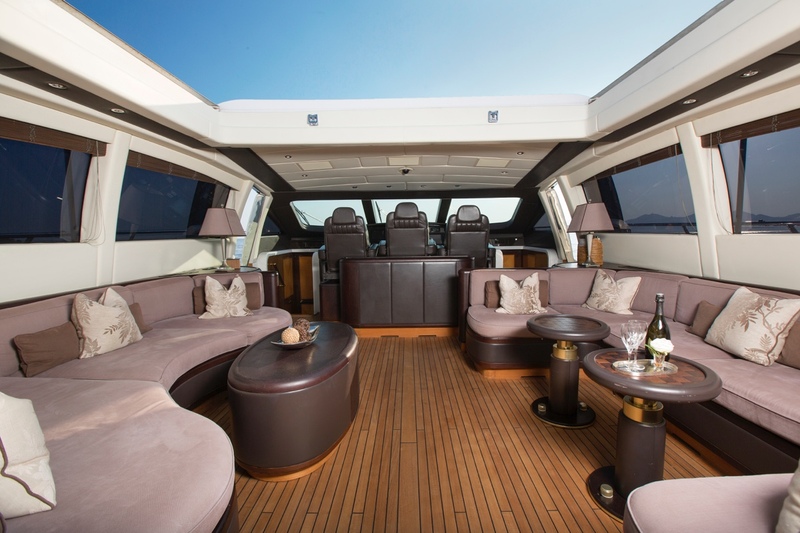 Luxury charter yacht DELHIA accommodates up to 8 guests in 4 cabins. 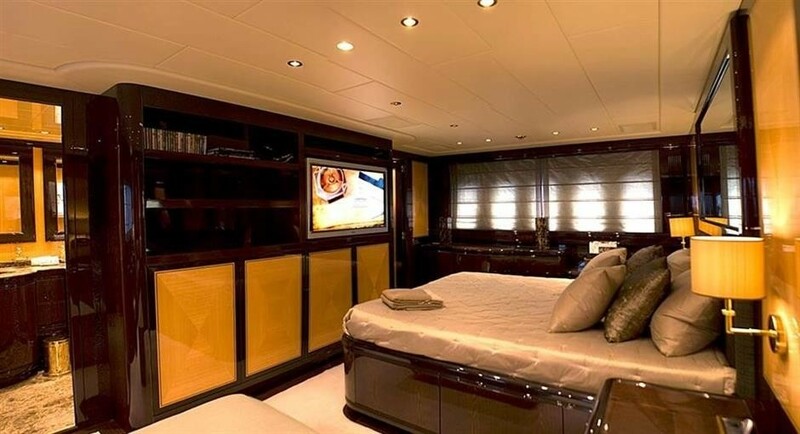 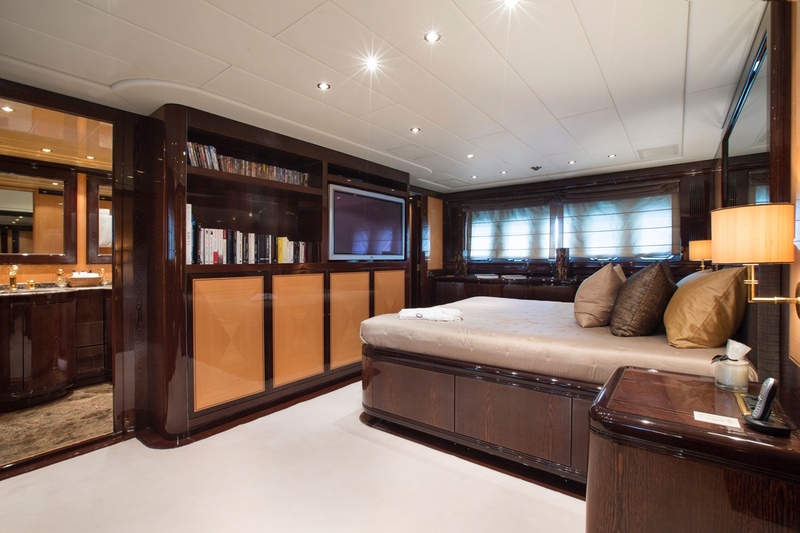 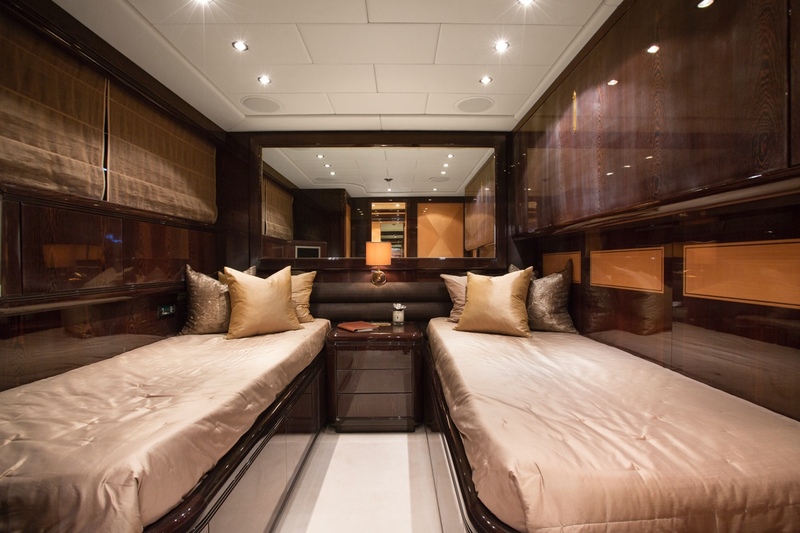 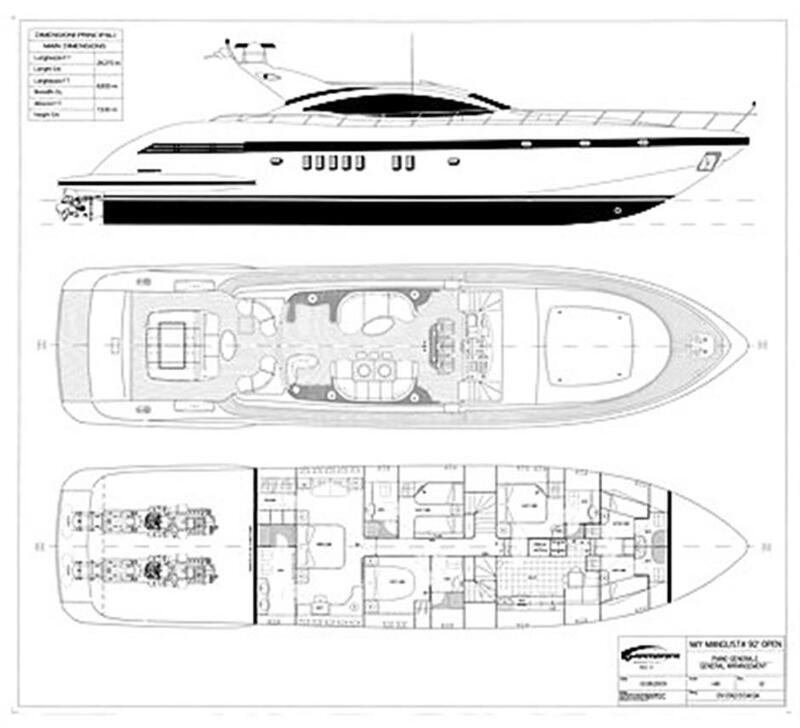 The master suite is amidships aft and full beam of the yacht featuring a center lined queen size bed, love seat, vanity, walk in wardrobe and en-suite facilities. 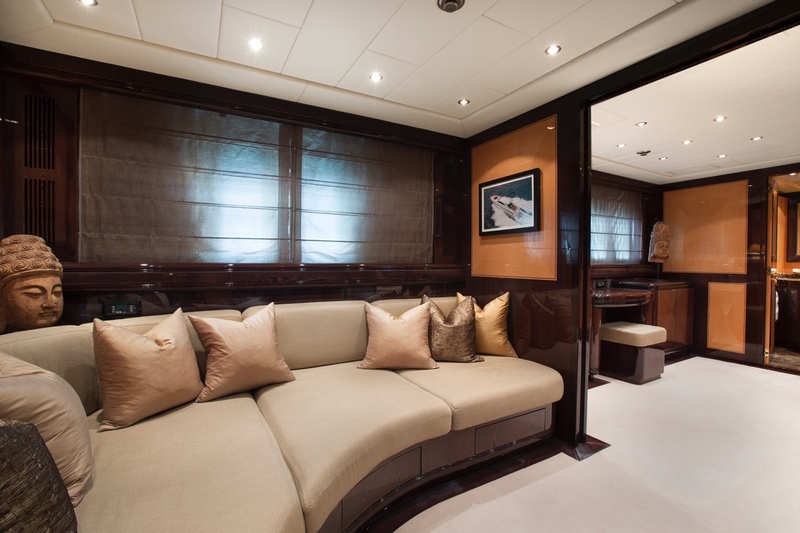 The master cabin sofa/lounge area can be closed off and converted into a single cabin with its own TV. 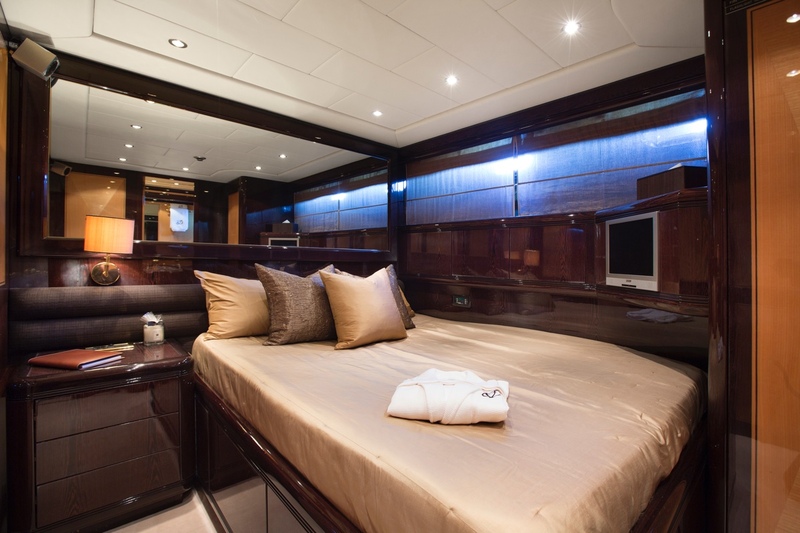 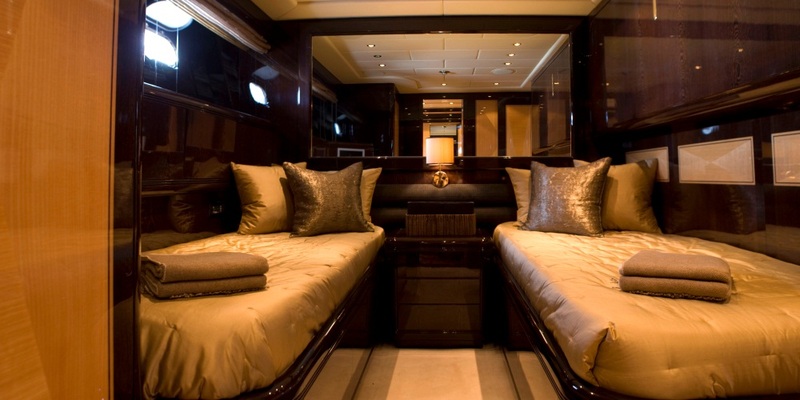 A VIP cabin offers a queen size bed and en-suite facilities. 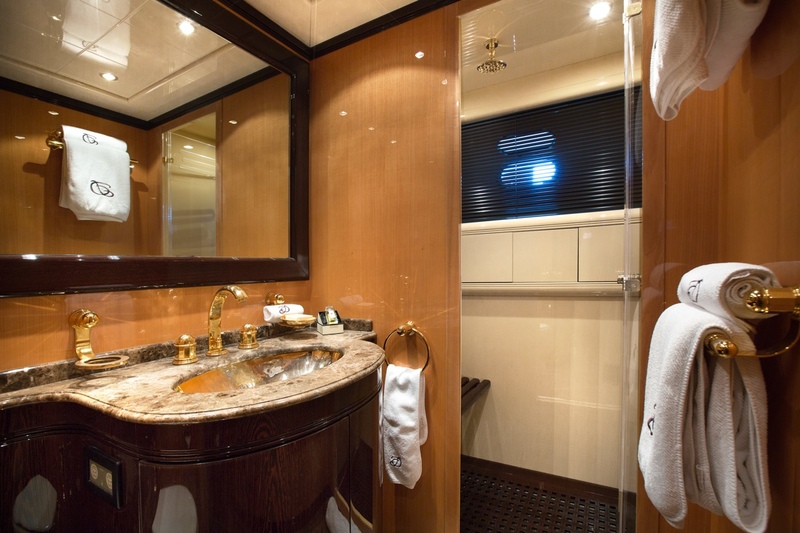 There are 2 twin cabins with side single beds and an upper Pullman berth with en-suite facilities.